Invasive non-native plant and animal species are the second greatest threat to biodiversity worldwide after habitat destruction. They can negatively impact on native species, can transform habitats and threaten whole ecosystems causing serious problems to the environment and the economy. 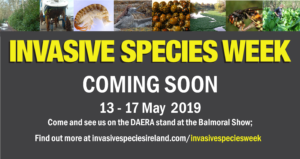 However, even though the project is no longer active, both organisations still work closely together relating to invasive species issues which concern the whole of the island of Ireland. This website still acts as a gateway to information relating to those Invasive Species Ireland issues. From here, users can still find information on a range of species, policy related to individual species or groups of species, and action plans to deal with species that threaten the biodiversity and economies of Ireland and Northern Ireland. Invasive species are one of the greatest threats to the environment but with your help we can make a difference. Why not follow our page today and keep informed about invasive species issues in Ireland and Northern Ireland?